A radical new history of the Victorian age: meet the forgotten and extraordinary freak performers whose talents and disabilities helped define an era. On 23 March, 1844, General Tom Thumb, at 25 inches tall, entered the Picture Gallery at Buckingham Palace and bowed low to Queen Victoria. On both sides of the Atlantic, this meeting marked a tipping point in the nineteenth century - the age of the freak was born. Bewitching all levels of society, it was a world of astonishing spectacle - of dwarfs, giants, bearded ladies, Siamese twins and swaggering showmen - and one that has since inspired countless novels, films and musicals. But the real stories (human dramas that so often eclipsed the fantasy presented on the stage), of the performing men, women and children, have been forgotten or marginalized in the histories of the very people who exploited them. In this richly evocative account, Dr John Woolf uses a wealth of recently discovered material to bring to life the sometimes tragic, sometimes triumphant, always extraordinary stories of people who used their (dis)abilities and difference to become some of the first international celebrities. And through their lives we discover afresh some of the great transformations of the age: the birth of showbusiness, of celebrity, of advertising, of 'alternative facts'; while also exploring the tensions between the power of fame, the impact of exploitation and our fascination with 'otherness'. "A wonderfully rich, compassionate and pungent potpourri of the extraordinary, the unusual and the rare. Turns our notions of Victorian prudery, propriety and voyeurism upside down. Brilliantly researched and written with great verve." 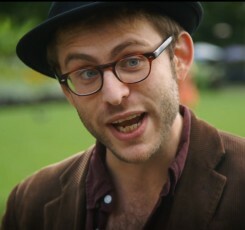 "A promising young historian with a taste for the exotic." "Highly readable. The life stories of those paid to be gazed at and ridiculed have been deftly teased from the archives, providing a sympathetic account of these amazing individuals." "The Wonders shines a bright light on the real human experiences behind Victorian freak spectacles. With carefully-researched historical detail and a knack for storytelling, Woolf reveals the off-stage struggles and success for a series of performers known mainly for their unusual bodies. 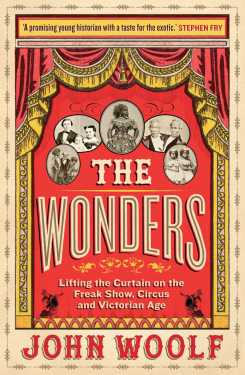 The Wonders traces the development of the freak show from its roots in the royal courts of Europe, to the fairs and travelling entertainments of the British working class, and across the Atlantic to the museums and circuses of America. Along the way, it uncovers the surprising complexity of life in the freak show—a life in which exploitation, empowerment, and economic opportunity can be hard to untangle"
"John Woolf's book is an intriguing and fascinating look into the world of "freaks" beautifully researched and well written." "John Woolf’s book will dazzle you with details of extraordinary lives, long underestimated by history." "As an actor and writer who has also performed in contemporary freak shows for many years, I find this book a refreshingly integrated and balanced account of these amazing lives." "Explores with subtlety and consideration the many facets of humanity's strangeness. A really excellent book and an important study of the physically marginalised and neglected." "A remarkable book. Painstakingly researched, and beautifully written, John Woolf tells a brilliant and vibrant history. By illuminating a world which we have done our best, as a society, to forget, The Wonders contextualises our current obsession with celebrity and the lives of others." " Fascinating and thought-provoking. A marvellously researched account of the freak industry - an extraordinary side of Victorian life which has been ignored for too long." Michael O’Mara have bought World English rights in John Woolf’s Peerless Prodigies: Freaks, Circuses and the Extraordinary World of P.T. Barnum , a reworking of his Queen Victoria’s Freaks which won this year’s Biographers Club Prize for the best uncommissioned proposal. Congratulations to John Woolf whose Queen Victoria’s Freaks is the winner of this year’s Biographers Club prize for the best uncommissioned proposal. Congratulations to John Woolf whose Queen Victoria’s Freaks: Performers at Buckingham Palace is one of five proposals shortlisted for this year’s Tony Lothian Prize. The prize will be awarded at the Biographers Club Christmas party on Tuesday 12th December.